Camping Cupulatta is a lovely, family friendly, campsite that occupies a wonderful position on the south eastern coast of the island of Corsica. This small pleasant campsite lies nestled between the stunning Corsican mountains and the beautiful Mediterranean sea and makes the perfect place for a relaxing family camping holiday. Porto-Vecchio harbour is just 7km away and is a great place to visit for the day. Porto-Vecchio has been a port is some shape or form since Roman times and the views from the top of the harbour are truly spectacular. On the campsite itself you’ll find a few activities to keep you busy during your holiday and a short distance from the campsite you can take advantage of a variety of activities including the beach, lots of hiking trails, horse riding, cycling, canyoning, sailing, diving and much more. 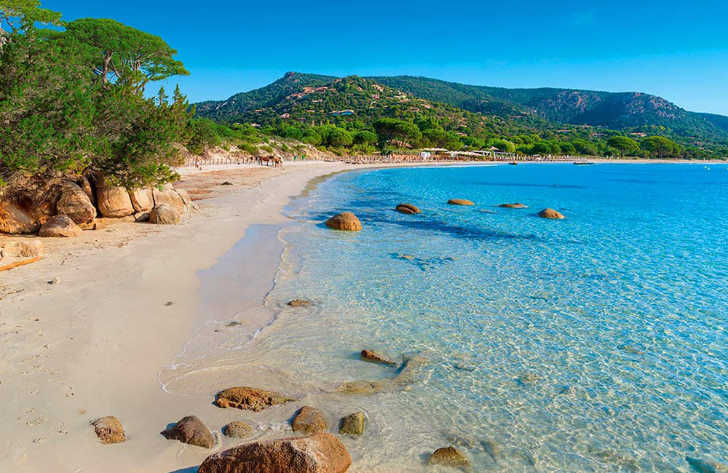 Although Camping Cupulatta isn’t on the coast, the nearest beach is fairly easy and quick to get to which makes the campsite an ideal base from which you can explore and enjoy all Corsica has to offer. Just 10 minutes away and you’ll find yourself on a lovely sandy beach where the warm clear waters lap against the shore, which is perfect for families of all ages. Back at Camping Cupulatta you’ll find a pleasant swimming pool area which is just great for relaxing after a long day exploring the island. Sit back and soak up the warm summer sun on the sun terrace or take a dip in the pool the choice is yours. Camping Cupulatta campsite offers a comprehensive selection of activities and facilities on site and also nearby to ensure you have a fantastic family holiday. On-site activities at Camping Cupulatta campsite include table tennis, boules and a playground. Facilities available at Camping Cupulatta campsites include WIFI, restaurant, takeaway, bar, groceries, games room, washers and dryers. Accommodation at Camping Cupulatta campsite includes a range of 2 and 3 bedroom mobile homes that are available from Canvas Holidays .